The life and death of today's rhino revolves around its horn. Being hunted to the brink of extinction for their horns, conservationists and scientists are trying to find ways to use the horn to save them. 1. It is made of compressed keratin, much like horse hooves, cockatoo bills, fingernails, etc. 2. Rhino horns grow throughout their lifetime, at a rate of one to three inches per year. 3. Baby rhinos are born without horns. 4. There is no scientific evidence to support rhino horn being effective in curing medical ailments. 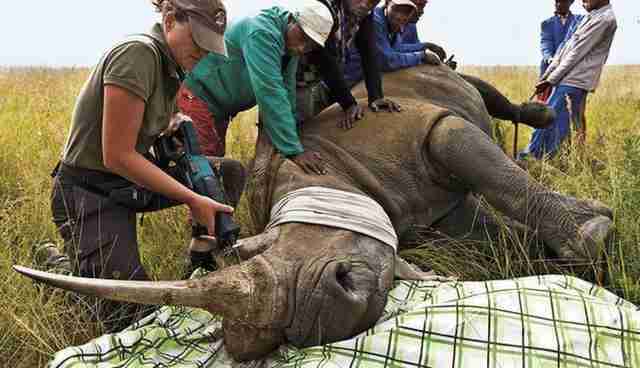 An obvious and tried solution to the poaching crisis has been to de-horn rhinos. The thought being if there is no horn, there is no reason to harm the rhino. This has produced mixed results. While some reserves have seen success, for others rhinos were still poached after the de-horning. The process is risky to the animal. It is an invasive procedure, and as with any situation involving immobilization and anesthetic, there is always a risk of complication. The process removes 90 to 93 percent of the horn, and needs to be repeated every 12 to 24 months. It is also quite costly. Per Save the Rhino, current published estimates for de-horning range from $620 USD (at Kruger National Park) per animal to $1,000 (on private land). Sadly with such a phenomenal price tag on the horn, that seven to 10 percent remaining still makes them a target for poachers. Sometimes this is unintentional; in the darkness, poachers may not realize the rhino is de-horned until they have killed it. So when considering this as an option, the risks need to be weighed. Is the rhino in a high-target poaching area? Are there enough security and monitoring to back up the procedure? The more recent method, developed by the Rhino Rescue project has been to make the horn less desirable by injecting it with a toxin. Ectoparasiticides are used in conjunction with a dye. The ectoparasiticides are safe for animals, but not consumable to humans. If ingested, they cause digestive issues. Once poached, it is this pinkish dye that conveys to users it is a tainted horn. Although still requiring an anesthetic, it is less invasive and only needs to be updated every three to four years. In addition it is fairly cost-effective when compared to other alternatives. Initially it seemed an effective deterrent. However In May of 2014, there were claims disputing its effects. 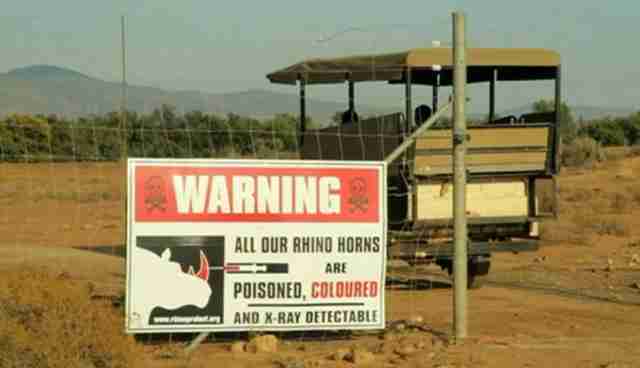 The report by South Africa wildlife experts implied the dye "failed to deeply penetrate the high-density fiber of the horn." This controversial report angered many who wondered at the wisdom in publicizing the findings. In 2013, the WWF donated microchips to the Kenya Wildlife Service (KWS). The chips were planted in every rhino in the country. The system works by implanting one microchip in the horn and another in the body. This, along with their rhino DNA database, helps to keep track of the animals. 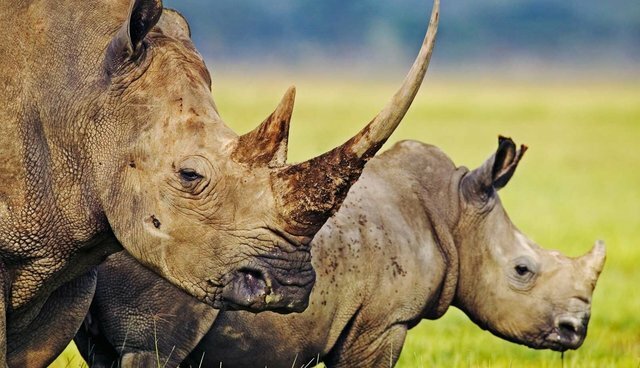 If a horn is found anywhere in the world, it can be traced back to the area of the poaching. According to KWS, "This will serve to strengthen rhino monitoring, protect the animals on site and also support anti-trafficking mechanisms, nationally and regionally."